When Saskia was 10 years old, she lost her father to a sudden heart attack. Soon after, Saskia started to develop symptoms of lupus, an auto-immune disease that causes the immune system to become overactive and attack healthy tissue and organs. Because of her lupus and the medication she was on, Saskia’s growth slowed down – so much that people thought she was the younger sibling to her identical twin sister. Saskia’s wish gave her the opportunity to have fun and spend quality time with her family, away from the struggles at home. But most importantly, it restored her faith that good things can happen – even to her – and that impossible dreams can sometimes be made possible. Her wish gave her hope for the future and provided her with the energy and strength needed to recover. Today, Saskia is in remission and has graduated with a degree in international economics. 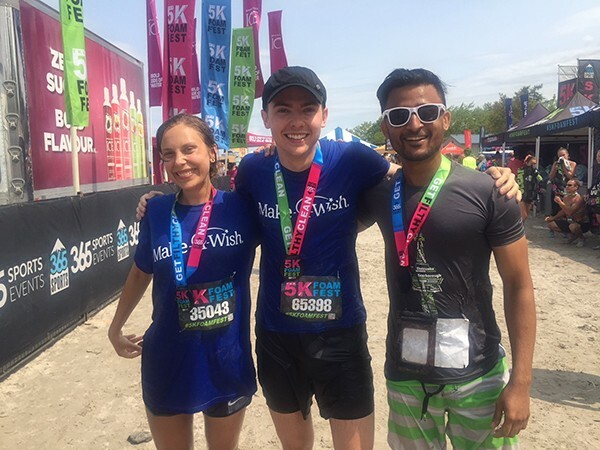 This year, Saskia is excited to be our Make-A-Wish ambassador for the 5k Foam Fest Canadian tour and participated in Toronto’s event where she navigated through a series of obstacles. Saskia’s life journey has equipped her with the strength needed to face any obstacle. Her participation in the event is a testament to her resilience. Having encountered several obstacles in her life, Saskia wants others to know that wish kids, like herself, don’t have to face theirs alone. The impact of a wish can last a lifetime and she hopes her story will inspire others to help Make-A-Wish transform lives, one wish at a time. Donate today so children can experience the power of a wish, just like Saskia.